Condition: Hardcover, green cloth. In great condition for its age. Firmly bound, text evenly toned. 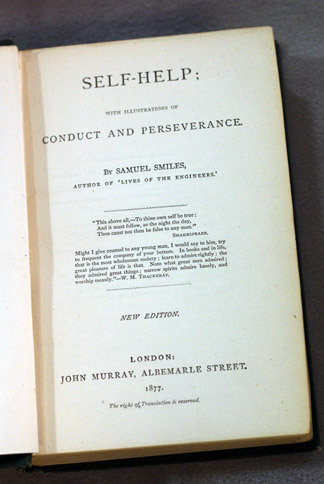 Self-Help; with Illustrations of Character and Conduct was a book published in 1859 by Samuel Smiles. 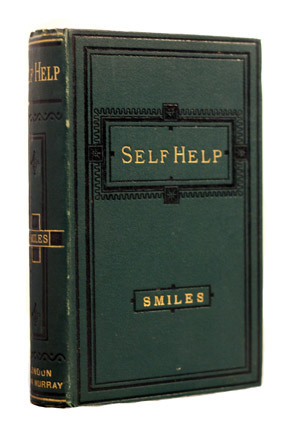 It is arguably the world’s first “self help” book. The second edition of 1866 added Perseverance to the subtitle. It has been called “the bible of mid-Victorian liberalism”. Samuel Smiles (23 December 1812 – 16 April 1904), was a Scottish author and government reformer. It sold 20,000 copies within one year of its publication. By the time of Smiles’ death in 1904 it had sold over a quarter of a million.Self-Help “elevated [Smiles] to celebrity status: almost overnight, he became a leading pundit and much-consulted guru”. The socialist Robert Tressell, in his novel The Ragged Trousered Philanthropists, said Self-Help was a book “suitable for perusal by persons suffering from almost complete obliteration of the mental faculties”. The founder of Toyota Industries Co., Ltd., Sakichi Toyoda was significantly influenced by his reading of Self-Help. A copy Self-Help is under a glass display at the museum that exists on Sakichi Toyoda’s birth site.